This year's Fall Ball Championship stacked up to be a pretty good battle; given that both teams involved ended the regular season with identical 5-4-1 records. The Tribe edged the Dragons 9-7 in the playoffs to advance to this years' wood bat final; and the Sin City Swing drew the top seed by beating Los Animales by a 12-4 margin to earn their shot at the title. Both teams were looking for their 1st PCBL Fall title; and had fought tooth and nail to get into this year's fall title. One thing's to be sure ... the stage was set for some PCBL Wood Bat Championship action! Tribe - 1st Inning: Kenny Lawson walks. Stephan Ohayon singles. Matt Alton hits an RBI double. Brett Urie walks. Tribe get 1 run on 1 hit; with no errors and a man left on base. Sin City Swing - 1st Inning: Jacob Risinger walks and soon steals 2nd. Fidel Jacobo walks. Lorenzo Ramos walks. Jose Morales walks. Luis Rivas gets an RBI single. S.C. Swing get 3 runs on 1 hit; with nobody left on base. 3-1 Sin City Swing. Sin City Swing - 2nd Inning: Eddie Nava doubles and advances to 3rd on a pass ball. Jacob Risinger walks and advances to 2nd on a wild pitch. Fidel Jacobo walks. Sin City Swing get 1 run on 1 hit; with no errors and 3 left. 4-1 Sin City Swing. Tribe - 3rd Inning: Stephan Ohayon walks. Ryan Davis hits an RBI double. Tribe get 1 run on 1 hit; with no errors and 1 man left on base. 4-2 Sin City Swing. Sin City Swing - 3rd Inning: Jose Morales singles. Luis Rivas singles. Both advance on a pass ball. Eddie Nava reaches base on a fielder's chioce. Andy Torres reaches base on a fielding error; with a run scoring on the play. Sin City Swing get 1 run on 2 hits; with 1 Tribe error and 2 men left on base. 5-2 Sin City Swing. Sin City Swing - 6th Inning: Andy Torres singles and advances to 2nd on a wild pitch. Jacob Risinger singles. Fidel Jacobo reaches base on a fielding error; as a run scores on the play. Lorenzo Ramos hits an RBI single. Jose Morales walks. Sin City Swing get 2 runs on 3 hits; with 1 Tribe error and 2 men left on base. 7-2 Sin City Swing. Sin City Swing - 7th Inning: Eddie Nava singles, steals 2nd and soon scores on a fielding error. Sin City Swing get 1 run on 1 hit; with 1 Tribe error and nobody left on base. 8-2 Sin City Swing. Sin City Swing - 8th Inning: Fidel Jacobo reaches on a fielding error. Lorenzo Ramos walks. Jose Morales hits an RBI single. Sin City Swing get 1 run on 1 hit; with 1 Tribe error and 2 men left on base. 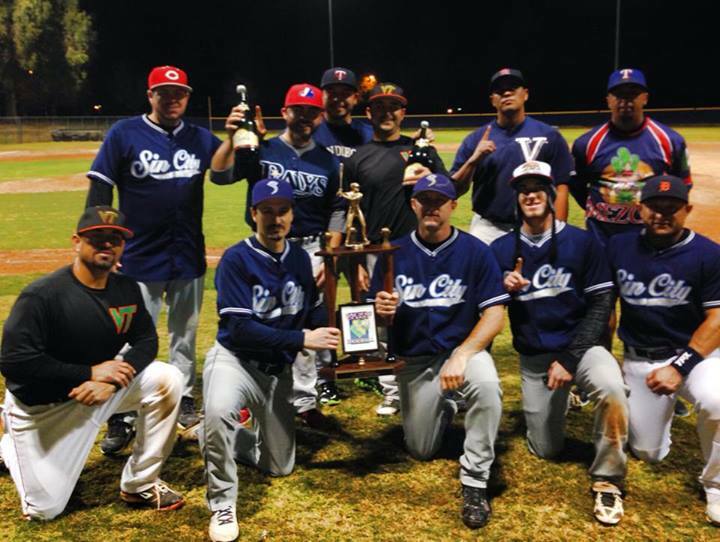 Congratulations to Sin City Swing ... PCBL 2013 Fall Wood Bat Champions!